Est. 2017 - 17 Quilts and counting! Today’s barn decorating revival became popular with a woman, in 2001, named Donna Sue Groves, from Adams County, Ohio. She wanted to honor her mother by hanging a colorful painted quilt square on her barn. Instead of just one quilt square, she began a community project with twenty quilts squares being displayed along a driving trail to encourage visitors to travel through the countryside. This was the start of our first quilt trail in America. Quilt trails are now being organized all across the country. Barn quilts are displayed around communities and then mapped out for tourist to follow these amazing works of art. They promote tourism and help draw visitors into our rural communities. Traditional stars and various quilt patterns are now being displayed on barns, homes, sheds and sides of buildings. They are also put on posts and displayed in yards and parks. 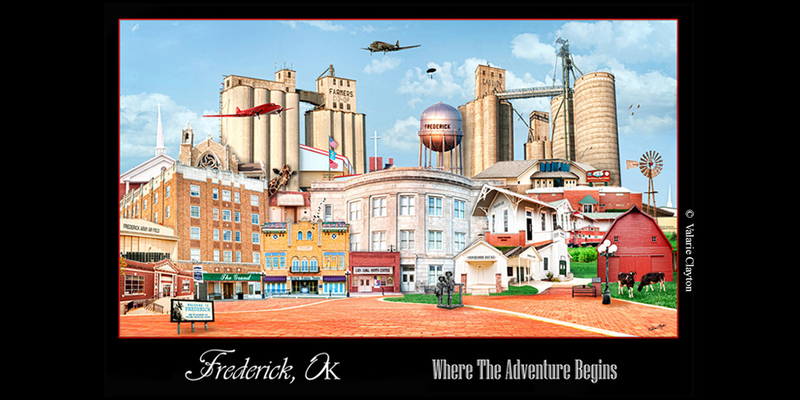 How it began in Frederick…. Jeanie Scott and Annette Rowe began making Barn Quilts as a hobby over the last year. Jeannie heard about them and then visited her sister Lynda Floyd in Bonham Texas and took their quilt tour. Head to http://visitbonham.com/things-to-see/barn-quilt-trail/ to look at what they have. You can find Barn Quilts on both ladies homes as well as Jeannie & Merlin’s building, East 100 block of Grand Ave. The ladies set up a booth at Arts ‘N Action and sold out of their stock at the time to a number of local residents. They can custom make Barn Quilts to fit a particular business logo or home colors. The quilts come in 1’ x 1’ up to 8’ x 8’ and are made of reinforced wood. From this spark the Tillman County Barn Quilt Tour was born. You can find maps and instructions at the Frederick Chamber of Commerce, Very Good Coffee Co, Box Inc, KC’s and Frederick Ace Hardware. If you have a Barn Quilt you’d like to register on the tour, please give the Frederick Chamber of Commerce a call at 335-2126. Exterior Grade Plywood ¾ inch, cut to size 4’ x 4’, 6’ x 6’, etc.